The Churchill Downs Racing Club silks were donned in the winner's circle for the 10th time Thursday when 3-year-old Rare Form recorded a front-running 2 ¾-length score in a 6 ½ furlong maiden special weight at Churchill Downs. Rare Form, ridden by Robby Albarado, returned $16 for his victory and earned $45,600 in purse earnings. 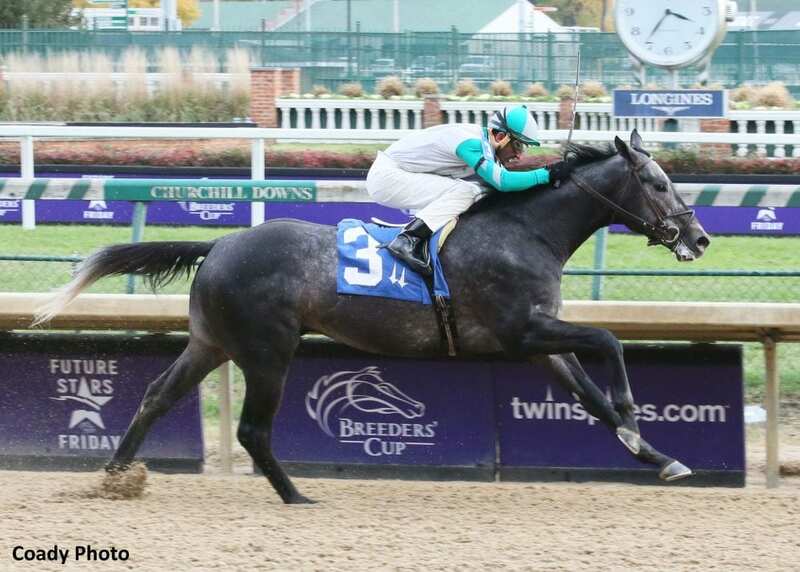 Rare Form was donated to the Churchill Downs Racing Club by Spendthrift Farm's B. Wayne Hughes and the majority of his purse earnings will be donated to the City of Hope Pediatric Cancer Research Hospital in Los Angeles. Hughes also set up a similar structure with the Fair Grounds Racing Club and more than $100,000 was donated to City of Hope, according to Racing Club Manager Gary Palmisano. The Churchill Downs Racing Club was inaugurated in 2016 to give horse racing fans an insider's look at horse ownership. To date, more than 50 club members have joined other ownership groups, according to Palmisano. The eight horses that have competed under the Churchill Downs Racing Club banner have earned $995,366, led by Grade III winner Warrior's Club's $724,104. This entry was posted in People and tagged b. wayne hughes, baldemar bahena, churchill downs, churchill downs racing club, City of Hope, Dale Romans, gary palmisano, rare form, Robby Albarado, warrior's club by Press Release. Bookmark the permalink.